I'm sure most of you will have seen this by now, but it's a fantastic model I just had to share. This is the Slayer Sword winner from the European Golden Demons this year, and it definitely deserves the award. There's no conversion on the model, but the painting is just to such a high degree. 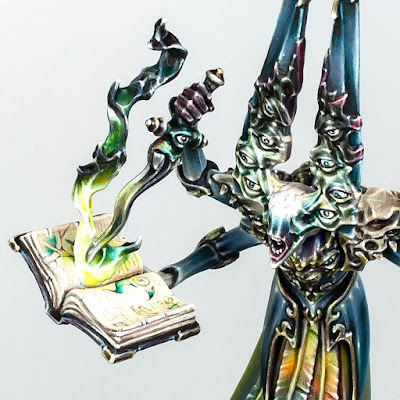 It has that Tzeentch look with the multitude of colors, but they have managed to retain a more muted, realistic look to it. When you look at the blue armor in the close up shot you can really see this. My favorite parts though are the flames from the book and the face. The flames have such an otherworldly look plus the brightness at the point where they start in the book is spot on. It really looks like a flare of light is emanating from there. The fact that it transitions so quickly through the greens to the black just helps reinforce the magical nature of it while at the same time reminding me of a real world chemical reaction, like a magnesium flare or when salt burns in different colors. The amount of colors worked into the super pale face works perfectly with the rest of the model, while still retaining an overall sickly pale look. My favorite part on the head are the veins on the back of the skull. 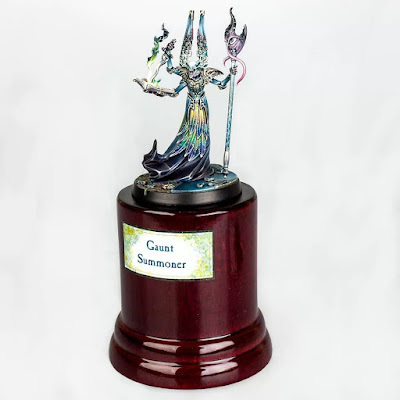 All in all this mini definitely deserved the Slayer Sword and I would really like to see some more minis from this painter, perhaps more of the Silver Tower set. Be sure to check out more views of the model at the official Games Workshop Golden Demon website. The Endless Deserts: Fiction Contest!